Dating in the gay world is no easy feat. Just ask Ryan J. Haddad. In his perfectly timed solo show Hi, Are You Single?, Haddad takes the audience on a journey through of his gay club exploits and the close-minded people he met along the way. Hi, Are You Single? follows Ryan through the highs and lows of dating as a gay man with cerebral palsy. The script is pretty basic. Gay boy talks about dating with a twist. Haddad explores gay bars hoping to make a meaningful connection with a future someone and finds himself turning away the ones that could be that special someone. All this happens while Haddad dares the men to look beyond his walker. What sets Hi, Are You Single? apart is Haddad's showmanship and ability to work an audience. Haddad has an incredible prowess for storytelling. The rapport Haddad has with the audience is unmatchable. He's smart and able to interact in a quick manner. And even when the audience hoots, hollers, and whistles, Haddad is able to take it in and maintain momentum. While the story may resonate with many in one way or another, Haddad digs deep into his personal life and is willing to share his saga with a room of friends and strangers alike. He's not afraid to be vulnerable and that should be greatly rewarded. Rather than fall into the multi-character trap of some solo shows, Haddad sticks to himself. When he does expand and recount dialogue he had, it’s through him. It allows the story to remain personal and not try to go beyond truth. It takes great talent to lift an average text and turn it into something wonderful. Director Laura Savia did just that. Savia guided Haddad through his script, helping him dive into a range of emotions. The trust between the two was evident on stage. It was clear that Savia challenged Haddad, pulling out a winning performance. From a production standpoint, Savia and lighting designer Isabella F. Byrd easily jumped from story to story, gay bar to gay bar in a manner that suited Haddad. With the gay bar music extravaganza as the soundtrack, the world of Haddad’s play was present with just a table, futon, flashy lights, and thumping bass. No matter who you are or where you are in your life, Hi, Are You Single? Will most certainly hit you. 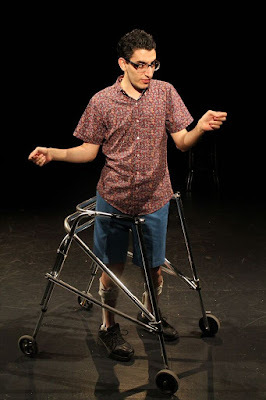 Ryan J. Haddad’s performance is something special and something you should seek out. And don’t worry if you missed it, Haddad and Hi, Are You Single? will be back. It’s necessary.